Traveling to see the Zags? Here’s your foodie’s guide to Anaheim. UPDATED: Wed., March 27, 2019, 11:35 a.m. 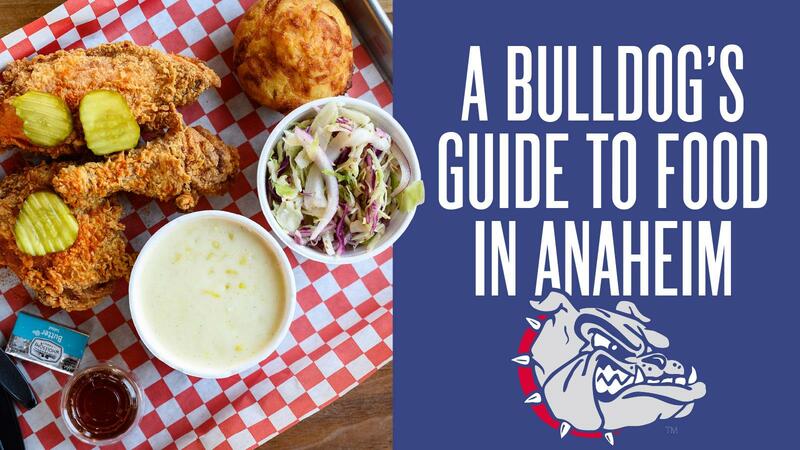 If you’re heading to Anaheim to see Gonzaga in the Sweet 16, you’ve likely already put together a mental checklist of the types of food you’re either craving or the places you’ve always wanted to eat. You’re probably going to In-N-Out Burger. You’re almost certainly eating tacos – more specifically, fish tacos. All solid choices for a visit to Southern California. It’s just that Brad A. Johnson would like to give you a few other options. As the food reviewer for the Orange County Register, it’s what he literally does for a living. More to the point, he’s also really good at it. Johnson is the nation’s only food critic to win both the James Beard Award and the Cordon Bleu World Food Media Award for restaurant criticism. Those are literally the two most prestigious prizes a food critic can win in America and worldwide, respectively. He’s as comfortable at the finest fine dining as he is at the truckiest food truck. He can tell you about foods from the farthest parts of the world that don’t even look like they’re from this planet. But he also can bring it right back to fried chicken. So that’s exactly where we’ll start. A few years ago, Johnson made a bucket list of the best places in Orange County to get fried chicken. His bar was KFC. Yep, the exact place you’re thinking. For him, it was an easy decision because it was a common reference point. He graded each restaurant’s fried chicken on whether it was as good, better or worse than the Colonel’s original recipe. Further Review: Learn more about In-N-Out, the Southern California burger restaurant that has gathered a loyal following up and down the west coast. His pick was a fancy-schmancy restaurant in Laguna Beach that only served fried chicken once a month on Sundays. So the chef at Three Seventy Common Kitchen + Drink did the only reasonable thing: He opened a fried-chicken restaurant in Old Towne Orange. Now Johnson can get his favorite fried chicken in Orange County daily. You should, too. Next, we’ll head over to the Anaheim Packing House food hall. It’s a renovated, and way cool, former Sunkist orange packing facility. It’s also a smart place to go if you have a group who rarely agree on what or where to eat. There are three very different places there that catch his eyes and tastebuds. First off is ADYA, an Indian restaurant with a focused but tasty menu that has been known to make Johnson’s highly regarded list of the 75 Best Places to Eat In Orange County. Though there aren’t lots of things to choose from at the counter, he’s a big fan of most of it. It’s that lamb sloppy Joe that he thinks you should order first. For something completely different, there’s The Blind Rabbit. It’s the hidden speak-easy that is actually the Anaheim Packing House’s worst-kept secret. So much so that it’s strongly recommended that you get reservations. The food there is fine, but Johnson said if you really feel like eating there, just get the burger. But let’s be honest, you’re not in a speak-easy to eat. You’re there to drink. And that’s what he says you should do there. If you’re going to eat pizza at a glorified food court, it at least should be really good pizza. That’s what Ecco Pizza Shoppe has. It’s wood-fired and he notes that “adheres to a lot of the tenets of authentic Neapolitan pizza, but there’s a uniquely crispy, crackery quality to the crust that sets it apart from anywhere else” in the region. So what is Johnson’s must-try pie? “A lot of pizzerias make something called Diavola, and this is the one you need to know about, topped with fresh chilies, thinly shaved Calabrese salami and a drizzle of chili oil,” he wrote in his list of the best places to get pizza in Orange County. It’s hard to get the top spot in Johnson’s annual OC culinary list. Arc has done that. And when it doesn’t get the No. 1 rating, it’s nearly always in his top five. It’s not just the quality that makes Arc so unique, it’s how the food is prepared. The only electricity in the kitchen powers the lights. Everything else – yes, every single thing – is cooked with wood fire. Johnson said there is this huge trend across the country right now with wood-fired kitchens and restaurants. Orange County is very much known for its multicultural food: Little Saigon, lots of great Mexican food everywhere and even some exceptional Japanese food. Despite the general affluency of the region, some of the best places are notably downscale. You’re probably ready for some great Mexican food and some supertasty tacos. Johnson has a couple of suggestions on that front, focusing on those relatively close to the Honda Center, where the Zags will be playing. First, let’s go to Anepalco. There are two locations, and lucky for you, the one in Orange is closest to Honda Center and is the better of the duo. It features sophisticated, Mexico City-inspired cuisine. Tacos la Calle is in nearby Buena Park. It opened last year and has already risen to one of Johnson’s favorites. It’s just a taco shop with only handful of different tacos, but they serve suadero, which is rare even in California, despite its popularity in Mexico City. There are dumplings, and then there are the dumplings at Din Tai Fung. Johnson isn’t the only person to love this restaurant. The wait for a table there can stretch up to two hours. They serve Shanghai-style soup dumplings, which are basically the little bite-sized soup dumplings that every other Chinese restaurant has tried to replicate but nobody else can quite get right. He said it’s impossible to eat just one. Published: March 27, 2019, 5 a.m. Updated: March 27, 2019, 11:35 a.m.